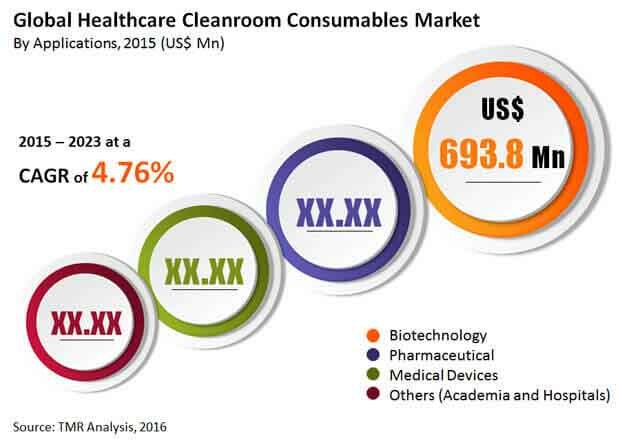 Owing to the large number of manufacturers spread across the globe, the vendor landscape of the global healthcare cleanroom consumables market has been rendered highly fragmented and largely competitive, observes Transparency Market Research in a recent report. The leading fiver companies in the market - Valutek, Nitritex Ltd., Texwipe, Kimberly-Clark Corp., and DuPont, collectively accounted for only a 52% in the overall market. The market suffers from a lack of differentiation in products and intense price wars. However, companies can benefit from an increased focus on ways of commercializing their products and employing cost-containment measures. According to the report, the global healthcare cleanroom consumables market will exhibit a promising 4.76% CAGR over the period between 2015 and 2023, rising from a valuation of US$2 bn in 2014 to an opportunity of US$3 bn by 2023. Of the key applications of the market, the biotechnology sector, which is presently the largest, is expected to retain its dominance over the forecast period as well. Geographically, the market in North America is expected to remain the leading regional market in terms of revenue opportunity over the report’s forecast period. The market has picked pace in the recent years owing to the increased demand for new drug varieties and advanced medical devices to treat the rising pool of patients suffering from a number of chronic conditions globally. As cleanrooms enable the ideal surroundings for undertaking research and development in these sectors, their demand has significantly gone up in the recent years, which, in turn, has led to an increased uptake of a variety of cleanroom consumables. Furthermore, the rising numbers of medical device manufacturing facilities across the globe and a massive rise in stringent quality and safety regulations associated with the pharmaceutical, biomedical, and medical device industries are also driving the market. The market is expected to find hordes of new growth opportunities in regional markets such as Asia Pacific and Latin America wherein the number of medical device manufacturing units has seen a major rise in the recent years. Owing to the low cost of establishment and operations, emerging economies such as China and India in these regions are becoming the preferred destinations for medical device companies, thus leading to the increased demand for necessary infrastructure, including cleanrooms.